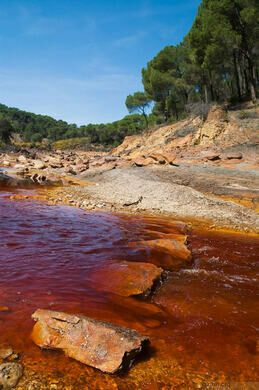 Originating in the Sierra de Huelva mountains of Andalusia, in the town of Nerva, Spain’s “red river” runs through the southwestern region of the country. 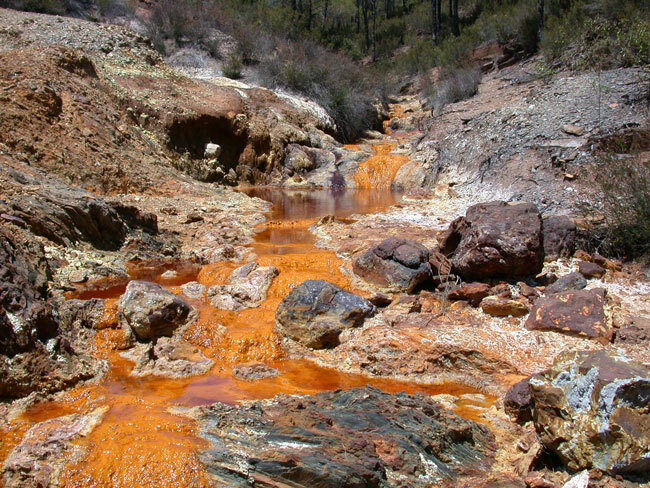 For approximately five thousand years, copper, gold, silver and other minerals have been mined along the river, with dissolving iron giving it a strange reddish hue. An ornate tower shows off a local artist's architectural flair. The Red River is often considered the birthplace of both the Copper Age and Bronze Age. The Iberians and Tartessians in the area began mining the river in 3000 BCE, followed by the Phoenicians, Greeks, Romans, Visigoths, and Moors. For hundreds of years, the river’s mines were abandoned until rediscovered and operated by the Spanish government in 1724. After large-scale excavations by companies from the United Kingdom in the 19th century made the river extremely dangerous for people because of the high acidity level, the multinational Rio Tinto Company was formed to operate the mines. Rio Tinto no longer manages the river, but by the end of the 20th century it had become one of the world’s largest mining companies. The high acidity keeps people away from the waters, but draws scientists in. Extremophile aerobic bacteria in the water provide conditions similar to those found in other areas in the solar system. Jupiter’s moon Europa, for example, is thought to contain an acidic ocean underneath its surface. Life in the Rio Tinto - the bacteria feed on iron and sulfide minerals in the river’s subsurface rocks - make the likelihood of life on Europa all the more possible. The river reaches the Gulf of Cadiz at Huelva. This amended headstone marks the grave of a participant in one of the most successful military deceptions of all time. Dead weights honor the dead of Portugal's fishing industry.